Kobo's latest and greatest ereader only started arriving on doorsteps yesterday, and it has already gotten its first update. A Kobo beta tester has posted a new firmware for the Aura One over on MobileRead. He reports, and I can confirm, that this firmware adds the promised support for OverDrive ebooks (as well as other features). Alas, the firmware only works on Kobo's two newest ereaders (this has been confirmed by a couple users). But it does work; I installed it on my loaner Aura One, tied in my OD account, and have gone through all the steps required to borrow an ebook. There's no way to browse just your library's catalog from the Aura One. All you can do is find titles which are in both the OD catalog and Kobo. From what I can tell the best way to find a library title is via search because it has an option to filter for titles found in OverDrive (the Kobo Store does not). The search results will include ebooks you can borrow, ones you can place on hold, and ebooks which your library doesn't own. An ebook borrowed from the Aura One can be found through one's account on the OverDrive website and read via OD apps (you can also push a loaned ebook to your Kindle). And in case you were wondering, the ebook is served from OverDrive, not Kobo; I found the same ridiculous thank-you blurb when I read this ebook on the OD website. But since the Aura One is not listed on the Linked Devices page on the OD website, you can't manage the Aura One from the OD site. And that's why borrowing an ebook involved searching, browsing a list, selecting the book, and then on the title's listing page you have to select the three dot menu to find the borrow option. Placing a hold on an ebook requires the same number of steps, which is why I am showing that screenshot at right. And yes, that is a screenshot form the Aura One; the screens can't show color but the software doesn't know that so it continues to process color images in color. When I first reported on the Aura One, I said that easy library ebook access could tempt me to switch from paper to digital library books. That might still happen, but as it stands Kobo isn't there yet. All in all, I found trying to read a library ebook on the Aura One to be a frustrating experience. This is not even close to the "one-touch OverDrive library lending access" promised in the press release, nor is it more convenient than reading a library ebook on a Kindle. In fact, I played around with the OverDrive site while working on this post, and I really think that it is easier to borrow an ebook from the site and push it to either a Kindle or a Kindle app. That was easy; Kobo's method is a hassle. And until they streamline the process, getting library ebooks on to the Aura One will be about as pleasant as with any other ereader. So if you don't have an Aura One, or live outside the UK, US, Canada, New Zealand, or Australia (Overdrive+Kobo integration is geographically limited), you're not missing too much. * Overdrive.com permits one search across multiple saved libraries for those of us with more than one card. Is this possible from the ereader? * Can one return books directly from the ereader, or does Kobo require the equivalent to amazon.com/myk ? Even if, to your disappointment, the borrowing process is not easier than with the Overdrive-Kindle combination, at least there is finally a comparable option for Anglosphere-library users outside the US. One: When I entered my OD account info i also had to enter my library card info even though I already had a fully set up OD account. I can’t find a way to enter a second set of library credentials. Two: I can’t find a way to return an ebook from the Aura One (thanks for catching that detail). I’m stuck with it for the full three weeks. No. Kobo might one day have a comparable option, and I will celebrate when it happens. But they’re not there yet. Is the library checkout a kepub or an epub? The older way of doing it was using ADE and then you would have an epub, and thus be locked out of the font customization options. You make it sound like you were frustrated with the checkout process, but it honestly sounds a whole lot better than the old ADE method. I never could get ADE to authenticate my Kobo and having to use a PC for part of the process is a chore. I end up just using Kindle exclusively for library checkouts. I honestly never have done it your way using the overdrive site. I’ve always used the library site. I didn’t even know that overdrive.com was a method to checkout library books. I’ll have to look into it. The library site is the OD site; it’s just got a library’s name slapped on top. Okay but what about my other question? Does it download a kepub or an epub? As I said in the post, I’m pretty sure it shows us an OD Epub file. Wow. That is really disappointing. Like you said, I was really hoping for a streamlined, “one touch” borrowing process. Maybe they’ll get it right in a future firmware update, but I can’t justify a $200 device when 99% of my books are OverDrive. I can’t/won’t sideload books because 1) Linux and 2) ain’t nobody got time for that. Just for a comparison, this is why I adore my Sony PRS-T2 (in spite of its other flaws). After I registered it using my Adobe credentials, I just point the web browser to any of my library’s websites (I have 3 sets of library credentials), log in to my library account, and tap a button to download my checked out book. Done. Now, browsing to FIND a book is laggy and can be tough on a small screen (so I often do my browsing/check out on an actual computer), but the download to device is seamless. 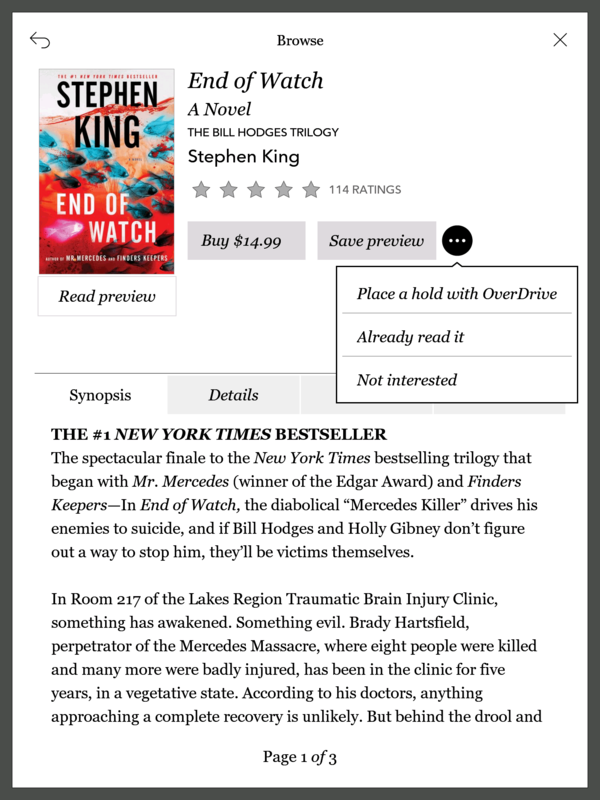 So you can put a hold on an OverDrive ebook that isn’t currently available through the link in Kobo’s catalog, but how do you check it out on your Kobo once it’s available? Most people set their holds to auto-checkout. 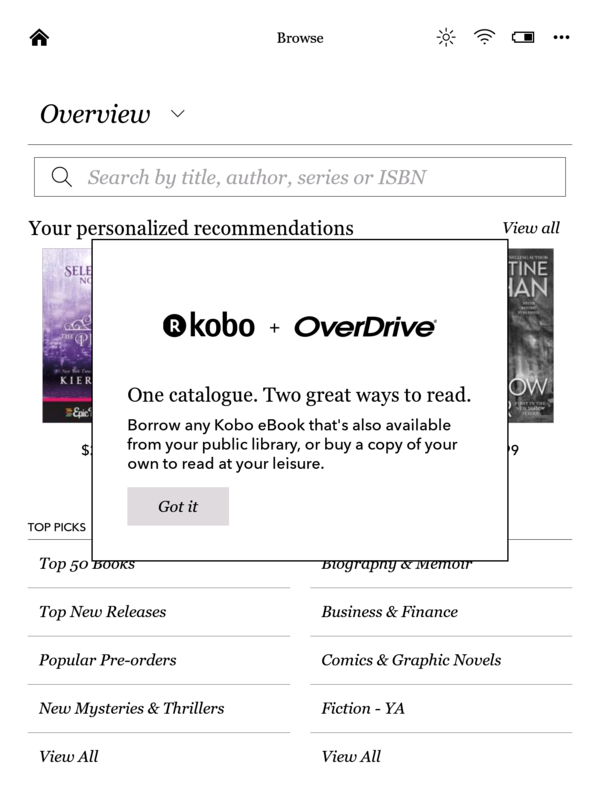 Can you access your Checkouts page from the Kobo to download ebooks directly to the device? Or do you end up needing to sideload? Not having a way to return anything is also problematic. I guess it means you have to also download the ebook somewhere else (app or ADE) and return it from there, or have staff at your library return it for you. Sony basically just installed the app on their PRS-T1/2/3 line, so you had full functionality. That worked very well. Maybe Kobo is attempting to get more sales by showing how often library ebooks aren’t available due to budgets and checkout limits, but hey here it is for $9.99 if you want to read it now! That app sure did make it easy, yes. I can’t see a way to return an ebook from the Aura One. I can do it on the website, sure, but not the ereader. And to be clear, I even double-checked the “details” page for the library ebook. And no, I can’t see a way to check out a hold – but I haven’t had a hold become available yet, so maybe that will solve itself. You say you can return an ebook “from the website.” Does that mean that for an ebook you downloaded to your Aura One, the Return Title button is displayed for that book on your Checkouts page on the OverDrive website? That usually disappears when you download to an app or ADE. If it’s still there, maybe that’s the intended return mechanic. Yes, I can see the return button on the site after the ebook is already on my Aura One. OverDrive has posted documentation on using the Aura One. The return button on the website is intended to be the way you return a library ebook early, at least for now. That info wasn’t posted before. So, I usually do Overdrive either from my computer or tablet or smartphone. If I check out a book via those devices, can I easily then download and read that book on the Aura ONE? I checked out an ebook from the OD website, then I went to my Aura One and told it to sync. That borrowed library ebook showed up on the Aura One’s home page as a “New” title. I downloaded and can now read it. Ok, so just to clarify… You go to your library’s overdrive site using a tablet/laptop/smartphone/whatever, find a book, and check it out. Then you sync the Aura One and it appears on the Aura One? That’s…not bad. I could live with that if they could enable multiple libraries. Excuse my noob comment, but can you modify a book’s font/typeset on Kobo with an OD book? And that’s a pretty good question; the Kobo-Pocket integration doesn’t provide the same font-layout-etc options for articles trasnfered from Pocket to a Kobo ereader. What does this have to do with Pocket at all? Nice, glad to hear it is not a problem to get an already borrowed book on the Aura ONE. I have my library holds on auto-checkout. Yeah, I could live with this! After my initial try at this I find it’s actually very easy. Just search for a book, limiting the results to OD available books. Borrow the book, the first time seems to require logging in to OD even if you already set up an OD account through the Kobo. Book downloads. After that it’s just borrow-download. Not near a computer? Sorry try again when you are. Hi to all, I purchased a Kobo Aura One from Japan but I don’t see OverDrive under Settings. Can someone advise? Anyway to update the firmware? The thing is, Kobo releases region-specific firmware. So the Japan firmware won’t include a feature only available in the US. And I can’t tell you how to reflash with the US firmware, so I think you’ll need to contact Kobo for this.